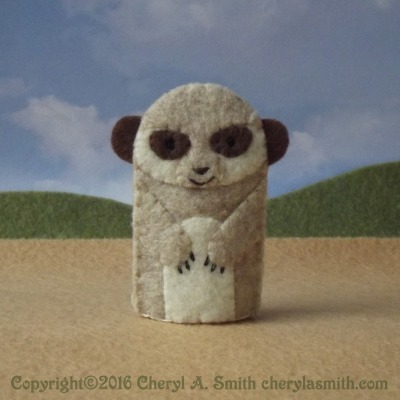 Start your own meerkat clan with this cute desert meerkat puppet. Stitched in the USA from an original pattern in oatmeal and cream colored felt with brown accents. This finger puppet is hand embroidered and stitched in *eco-friendly felt from an original pattern. The body measures approximately 1-1/2 inches wide by 2-1/2 inches tall and will fit most fingers. No glue is used in the creation of any puppet. Everything is firmly stitched in place. Each meerkat is an individual - so facial expressions and stitching may vary slightly from the photo. *eco-friendly felt is manufactured in the USA from high quality polyester fiber made from 100% post-consumer recycled plastic bottles.